By John Loven, MRA In times when earnings and growth are stagnant, or even contracting for a period, how do you make the work day a rewarding experience for your staff? MRA profiles give you a way to maximize the positive impact of motivational and rewards programs. In boom times, with rapid growth and growing earnings, it is easy to equate workplace rewards with bigger paychecks and elevated titles. In times like these, when earnings and growth are stagnant, or even contracting for a period, how do you make the work day a rewarding experience for your staff? Motivation is still mission critical. But rewards are no longer focused on attracting scads of new talent. Rather the goal is to keep the best and most productive people with you through the down turn when you can't just wave bonus checks or point to corner offices. Make no mistake about it: aggressive organizations which understand how to tailor rewards to personalities are poaching and cherry-picking as they staff-up for the recovery to come. Don't let your best performers wander off to join a competitor. You can fight back: MRA profiles give you a way to maximize the positive impact of motivational and rewards programs. The "Strengths and Restraints" section of an MRA report is probably the most often read when a manager thinks about an employee. But just a little farther down the page is a list of rewards. That's where the key to motivation lives. Let's see how it works. Envision a grid of four quadrants. Label the columns "Tangible" and "Intangible." Tangible and intangible rewards are very valuable, but you can put the tangible ones in your pocket or your piggybank. The intangible ones stay in your memory. Then label the rows "Public" and "Private." 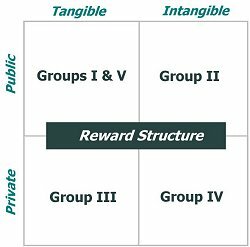 This grid represents a simple and practical analysis of reward structures. Standing someone up at the luncheon for a round of applause is intangible and public. Getting a health club membership at the luncheon is tangible and public. Getting a $25 gas card and a handshake in the boss's office is tangible and private. Having people stop by your cubical and thank you individually is intangible and private. What are the signs of poor reward structuring? I taught a seminar at a US Navy laboratory for about 50 engineers. The event was organized by Lt. Commander Dave, an engineer himself. Just before we began, the commanding officer breezed in and said," Hey, guys, before we start, let's have Lt. Commander Dave stand up and everybody give him a round of applause. He did a great job putting this together." Everyone dutifully did so. During the first group exercise, I walked over to Dave and said, "You didn't enjoy that did you?" Dave replied, " $%@#*! I hate it when he does that." The last thing on earth the CO wants is Dave looking for another assignment, but the officer is busy making it happen because he had no sense of what constitutes a reward to a Group III engineer. You can see where the MRA Profile Groups lie on our rewards grid. A good manager will be attentive to the grid and even go deeper. The CO should have complimented Dave in private and offered a tangible reward if possible. Had he been able to read the "Rewards" section of Dave's profile, he could have made a much more effective and motivational choice. Another hallmark of poor reward structuring is regularly hearing the old adage, "No good deed goes unpunished." High Ascendancy people like authority, control, and access to the "big picture." Reinforcing and expanding these areas of their work - for instance, giving them larger roles in more challenging projects - feels like a reward to them. Low Ascendancy people might well feel burdened by the same assignment change because the work of achieving consensus and cooperation just became riskier. High Sociability people regard any opportunity for more positive interaction and communication with others as a reward. Giving them the opportunity to present, train, or be a corporate resource in their area feels like a reward, as long as the situation is not combative or contentious. Low sociability people often find such activities a strain. Naturally, we divide the work load according to organizational needs, and tailor every decision to the profile. But you should recognize that if a particular action or assignment is going to feel like a reward, then use it as one in your motivational efforts.